Past scandals involving Iranian-born individuals buying St. Kitts and Nevis citizenship to evade sanctions and invest in the U.S. highlight the potential vulnerabilities of citizenship-by-investment programs — which have been branded “passports for sale.” In some cases, those prepared to pay $100,000 or more for citizenship don’t even need to travel to the country before getting the documentation. Five Caribbean nations currently offer citizenship in exchange for either a one-off contribution to the nation or an investment in a designated sector, such as real estate. Many of those countries’ passports allow visa-free travel to the European Union. 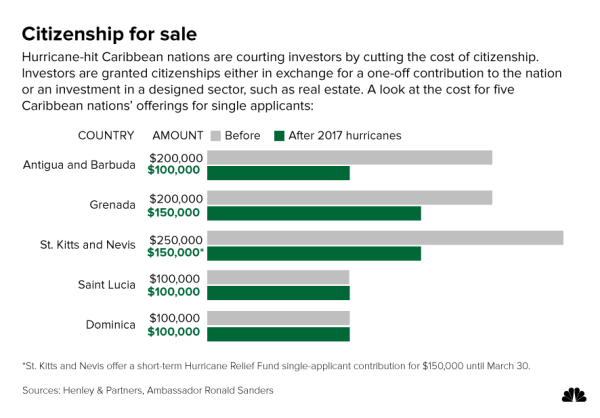 In September, St. Kitts and Nevis set up a “hurricane relief fund” which allows foreigners to contribute $150,000 in exchange for citizenship. The program, which is open until the end of March, is $100,000 cheaper than the country’s previously lowest-priced citizenship-by-investment offer. Antigua and Barbuda then followed suit, halving its program’s basic contribution from $200,000 to $100,000, according to Ronald Sanders, the country’s ambassador to the U.S. It wasn’t the first time the integrity of Caribbean travel documents has come under fire. By November, Canada had revoked St. Kitts and Nevis citizens’ right to visa-free travel to the country. And the following month, St. Kitts and Nevis recalled all passports issued without the key information included. Sanders, the Antigua and Barbuda diplomat, criticized St. Kitts and Nevis’ decision to cut the cost of citizenship, claiming his country had little choice but to follow suit.